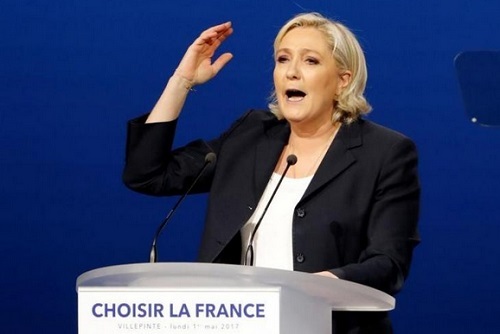 Le Pen accused of speech plagiarism – Royal Times of Nigeria. French far-right presidential candidate Marine Le Pen has been accused of plagiarising defeated rival François Fillon in a speech she delivered yesterday. Several sections of her speech in Villepinte, North of Paris, appeared to repeat almost word-for-word comments Mr Fillon made in an address on 15 April and the similarity in the speeches was pointed out by the Ridicule TV YouTube channel, initially set up by François Fillon’s supporters to attack Mr Macron before the first round of voting that saw Mr Fillon eliminated from the contest. Ridicule TV said the far right presidential candidate had plagiarised Mr Fillon’s speech word for word and set the two speeches side by side, inviting viewers to make up their own minds. Ms Le Pen is due to face centrist Emmanuel Macron in the final round on Sunday.